This is my kind of book, only 213 pages long with a prologue and epilogue and 36 chapters in between, evidence of how fast-paced a novel “Moloch’s Children” is; in a tale that reminded me of the works of Dennis Wheatley, Ramsay Campbell and Richard Matheson; although it’s not as “quiet” as these last two writers. In his short fiction, Riley has never been one to shirk away from bloody horror and he doesn’t here. The novel centres around Elm Tree House and its surrounding grounds. 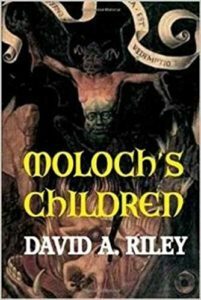 It is an abandoned place that has a dark reputation, one of those “You don’t want to go there” places so prevalent in horror fiction and film, but local poacher, Teb, doesn’t have a choice and what he sees there will change his life forever. Cue the appearance of novelist, Oliver Atcheson, who is recovering from the death of his wife and his own nervous breakdown. The house and the grounds seem the ideal place for an artist’s retreat, even though the locals wouldn’t go near it, but why does it have such a fearsome reputation and what are those strange brass feet that have been discovered in the cellar? Perhaps all will be revealed to the painters, poets and sculptors who have taken up residence there, or it will be revealed by a local historian who knows all about the medieval monastery built on the original site which was put to the torch while all the so-called devil-worshipping monks were hanged in the nearby woods and the Abbot was hung, drawn and quartered in the village square, and what was left of him was left hanging in a cage in the village as a warning to others before those remains mysteriously vanished. It’s good vs evil, but who will win, and what will be left of them, in terms of mind and body, and perhaps, even soul? 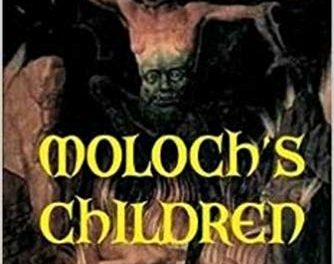 Read “Moloch’s Children” and find out.